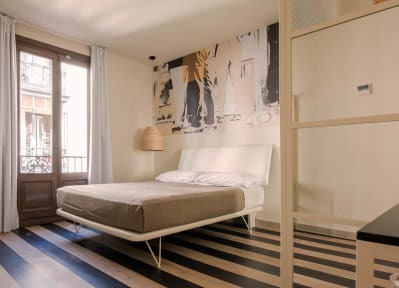 Room007 Select Sol is the new hotel of the brand Room007 that is operating in Madrid and it will operate soon in Barcelona and London as well. Our hotels are thought for all kind of clients, from young folks that are looking for tranquility to families and groups of friends that are going through the trip of their lives. Apart from a great level of comfort, our hotels are design to be visually attractive with a great emphasis in the urban, cosmopolitan and functional design. Furthermore, we are also responsible towards the environment, so that is why we handle restoration of downtown buildings and turn them into optimized spaces with energy efficiency. In short, we are a modern and young company that is aiming at offering the very best experience to our guests and travellers in the cities where we operate. Our location could not be more perfect. We are in the very center of Madrid, which means that we are practically in the kilometer cero of Spain, the places where the whole Spanish states has been created and configured. We are truly near from some of the most emblematic landmarks of Madrid, such as Plaza del Sol, Teatro Real, Plaza de Oriente and Plaza de la Villa, amongst other emblematic landmarks of the Spanish capital. 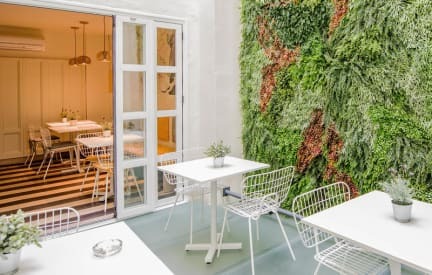 In addition, since our location is such privileged, you can reach easily walking the main public means of transport of Madrid: Commuter Train; Subway; and Bus Service. Room007 Select Sol offers a great variety of accommodation options for all kind of guests. We have private rooms, double rooms and family rooms, all of them with diverse grades of details and quality. In addition, we have some common areas where travellers and guests can get together and exchange some words with regard to past experiences and in particular future plans. When reserving more than 5 rooms a non refundable prepay of 25% is required. For reservations of more than 800 euros a non refundable 25% will be charged. Important: For important dates , The Hotel has the right to check if the credit card provided is a valid one.